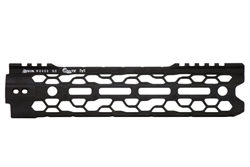 The O2 Lite is the is the newest forend in the ODIN Works lineup. Compared to other lightweight solutions, the O2 Lite has it all; looks, strength, price, and functionality. 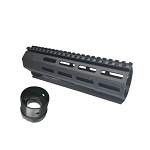 The O2 Lite is engineered and designed with all new lightening cuts and scallops to reduce weight by 20% all while remaining fully functional with QD holes and KeyMod slots. Free float. Made from 6005-T651 Aluminum. Engineered with advanced ergonomics for comfort and improved performance. Accessory rails can be placed at 3, 6, and 9 o'clock positions and can be joined to create continuous Pic Spec Rail. Four or more QD attachment points. 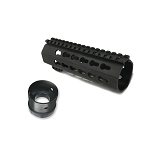 Made to fit Magpul QD. 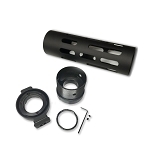 Engineered to allow for low profile gas block to fit inside.